I've had the pleasure, this week, to stay at the Bahia Resort in San Diego. This family-owned hotel is a gem full of tradition. 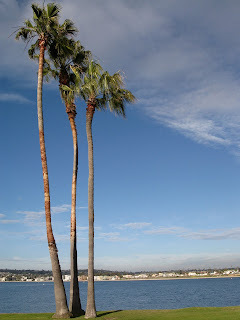 I've heard a few stories from staff while I'm here and the one thing they convinved me of was this--this is where I will stay when I come to San Diego in the future. Even though San Diego is a pretty big place, it feels "small" here. There is a private beach on the bay, and all of the other amenities you want in a large hotel. But the atmosphere is homey and cozy. A couple of blocks away, within easy walking distance, are shops and restaurants, the Belmont amusement park with an old wooden roller coaster, and, sigh, the ocean. That's the best part for me. The ocean. Oh, and Seaworld is on the opposite side of the hotel! So, great place for families or to just get away. Might even be kind of nice for a little writer's retreat. Food! I forgot to mention the food. I'll just say the meals at the hotel cafe are very reasonably priced and excellent. Enuf said for today. Perhaps more to come. 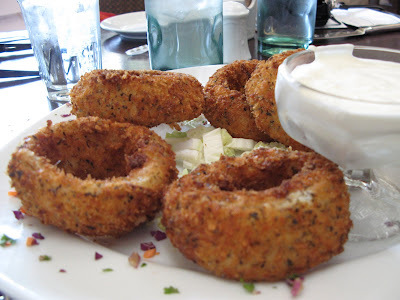 I hadn't read the blog when I first saw the picture of the onion rings- I thought they were donuts! WOW!I could make a pig of myself over those! Oh my gosh, Maddie! You know how I am about onion rings! I tell ya, these guys were monstrous sweet onions in a very crisp and peppery batter with a nice sauce. I wasn't paying a lot of attention to what the sauce was but the onions... wow. I gasped when they set the plate down! I have never seen onion rings like this in my life! One More Sale Day on Fictionwise!